Though tattooing was already present in much of Europe, during the 1700s, the visibility of exotic voyages taken by the likes of Captain James Cook helped cement the connection between tattoos and seafaring men in the popular media. The English word “tattoo” is actually a descendant of the Tahitian word “tatau,” which Cook recorded after a stop on the island while travelling in the South Pacific. European explorers frequently returned with tattooed foreigners to exhibit as oddities in the West, like Omai, the native Raiatean man Cook presented to King George and members of British royal society. Such publicity soon ignited a more widespread fascination with body art. 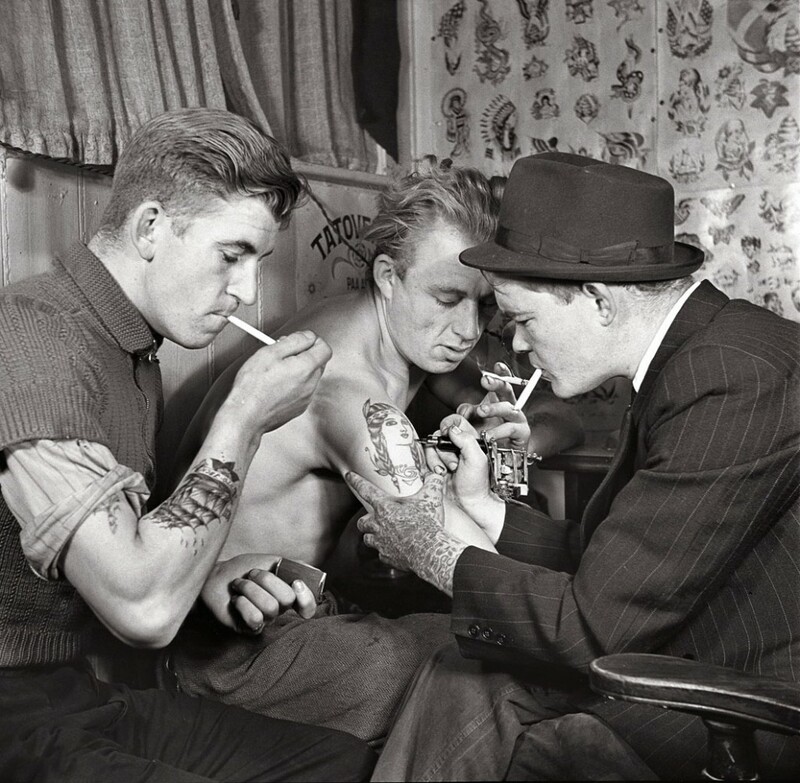 Top: A scene from Tattoo Jack’s shop in Denmark, circa 1942, from the book “Danish Tattooing” by Jon Norstrøm. 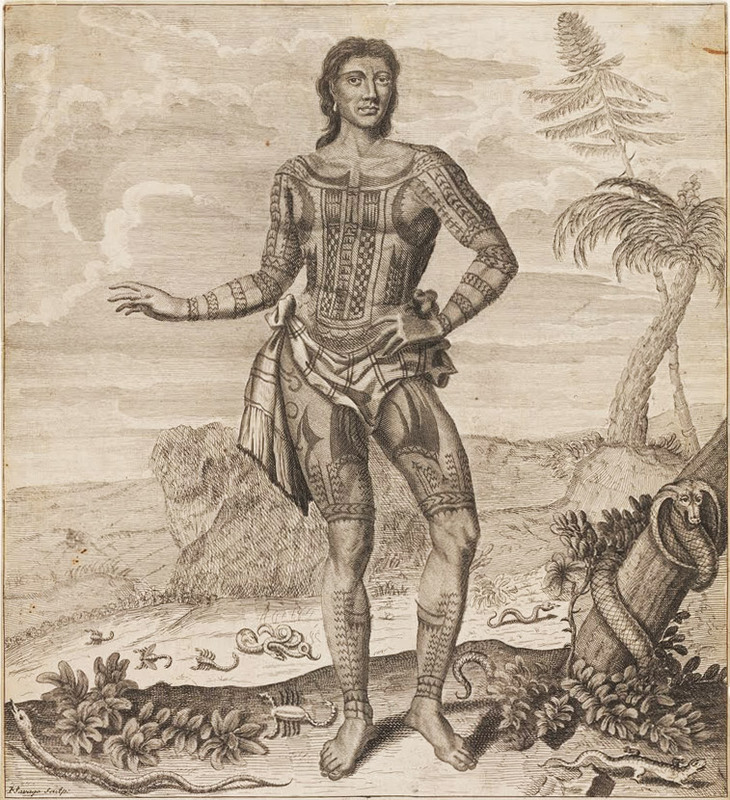 Above: An etching of “Prince Giolo,” a tattooed slave captured from the Island of Miangas by William Dampier’s expedition in 1691. “Explorers like Cook took sailors to the South Pacific, where tattooing was a highly developed art form going back centuries,” says C.W. Eldridge, the founder of the Tattoo Archive in Winston Salem, North Carolina. “These sailors wanted to bring back a record of this style of tattooing, and there’s no way to take a tattoo home except in your skin.” In places like Tahiti and New Zealand, tattoos were created using bone and soot, as their native populations weren’t familiar with metals until Europeans arrived. Many of the ordinary sailors on these crews returned with new tattoos, a tradition linked to their nautical lifestyle. Body art was particularly well-suited to the transient and dangerous nature of life at sea. “These sailors were traveling the world, and wanted to bring back souvenirs from places they had visited,” explains Eldridge. “Aboard a ship, you don’t have much room to carry fancy souvenirs, so you end up getting tattoos as travel marks.” By the late 18th century, navy records show that around a third of British and a fifth of American sailors had at least one tattoo, while other accounts reveal that French, German, and Scandinavian navies were also fond of getting inked. 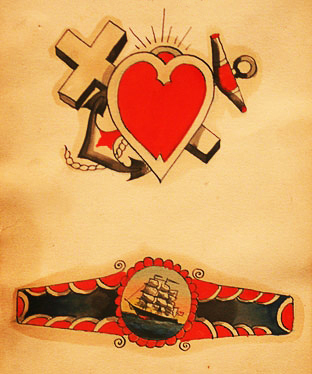 Two vibrant nautical designs by tattoo pioneer Samuel O’Reilly. Captain Elvy, who worked as a sideshow attraction, displays his beautiful back piece designed by “Sailor” George Fosdick. 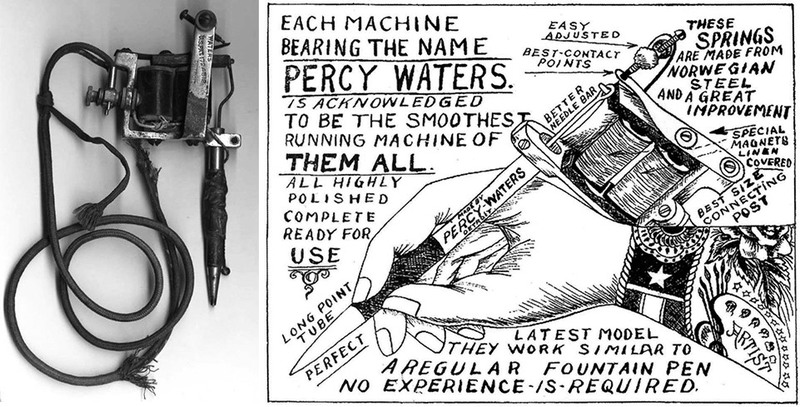 A photograph of Percy Water’s tattoo machine and an advertisement from 1928, which mimics the artistry of hand-drawn flash. This system of shared knowledge also helps explain why nautical designs were commonly copied and spread from artist to artist. “A lot of classic symbols were passed down from one war to the next, even going back to the Civil War,” explains Eldridge. “The tattooer might take an illustration, an etching, or a block print, do a drawing from that design, and put that on his sheets of flash,” the name for the paper ads tattooists created to show off their wares. Another tattooist would see a design and, in some cases, do a tracing directly off the person’s arm. “The designs were copyright-free and in the public stream,” Eldridge adds. Left, a 1907 portrait of Mrs. Maud Stevens Wagner, the wife of tattooist Gus Wagner. Right, a sailor with a patriotic chest piece by West Coast tattooist Bert Grimm. 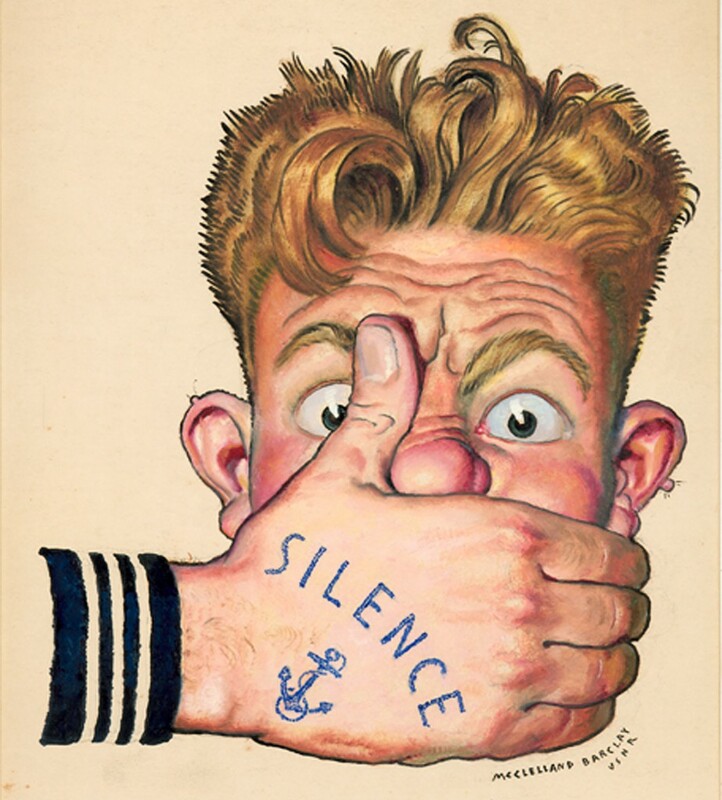 Even official U.S. Navy posters incorporated the ubiquitous nautical tattoos, like this image from the “Loose Lips Sink Ships” campaign of the ’40s. Despite the industry’s saturation of generic nautical designs, a few artists like Charlie Wagner and Percy Waters helped propel traditional tattooing through their distinctive artwork. One of the most lauded innovators was Norman “Sailor Jerry” Collins, a Honolulu-based navy veteran who combined stylistic elements from Japanese, American, and European techniques to create his own unique look. Lodder believes that Sailor Jerry’s influence on contemporary tattooing can’t be overstated. “He was an incredible draughtsman and artist who made use of the technical limitations of the medium to produce incredible designs. 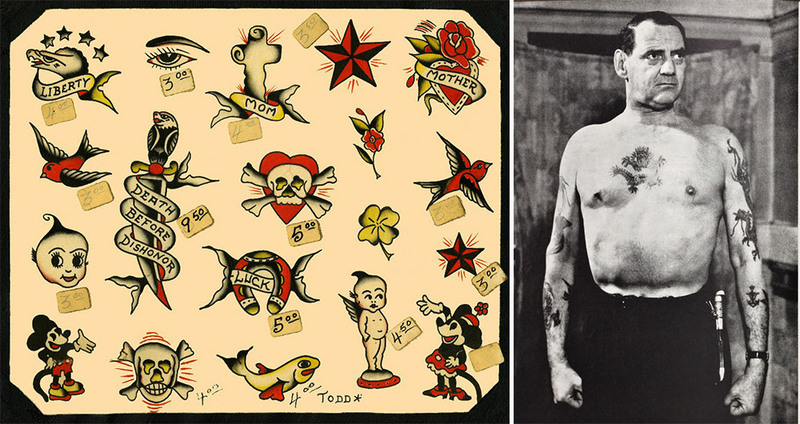 His pieces are complex enough to have life and energy, but simple and stripped-down enough that they look great in the skin, are readable from a distance, and age superbly.” Eldridge agrees that Sailor Jerry had a profound influence, possibly most distinguished by his ability to execute designs that looked even better on skin than they did on paper. 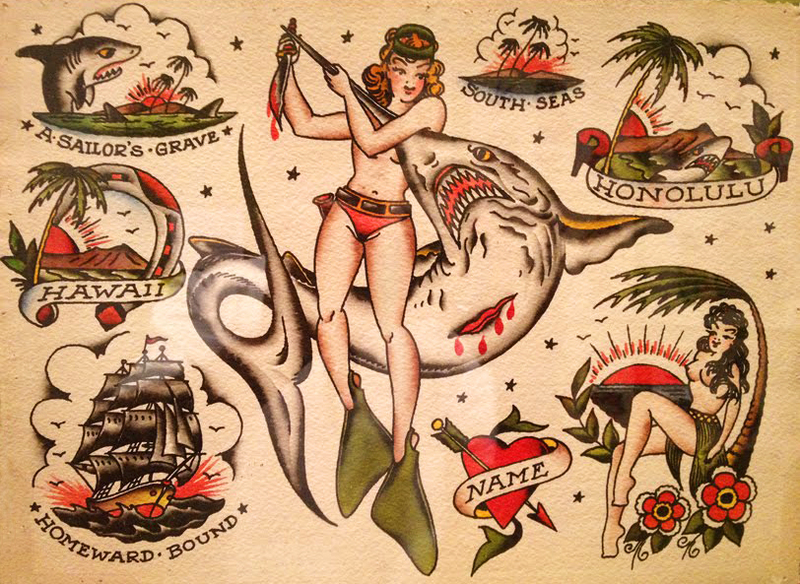 A sheet of Sailor Jerry’s flash shows his expressive, clean-lined style. In Britain, the expansion of professional tattooing was partly due to the trendiness of tattoos among the aristocracy following the Prince of Wales’ acquisition of a “Jerusalem Cross” during a trip he took to the Holy Land in 1862. “All the major London tattoo artists around the turn of the century made much of their celebrity clients—kings, princes, barons, music hall stars and entertainers—and their adverts were placed among those for champagne and high-end cigars in the tabloid press,” Lodder says. Left, traditional American designs featured on Col. Todd’s flash in 1963. Right, King Frederik IX of Denmark shows off his tattooed torso. Meanwhile, the popularity of tattooed characters in circus freak-shows spread the opposite message, that tattoos were only for those living in the darkest underworld of human existence. Beginning with the natives brought back by European explorers, people whose bodies were covered in tattoos realized they could make a living by exhibiting themselves to a paying public. “Eventually, sailors who had spent their lives at sea and had gotten heavily tattooed came back and went into show business, working with circuses or carnivals,” Eldridge says. 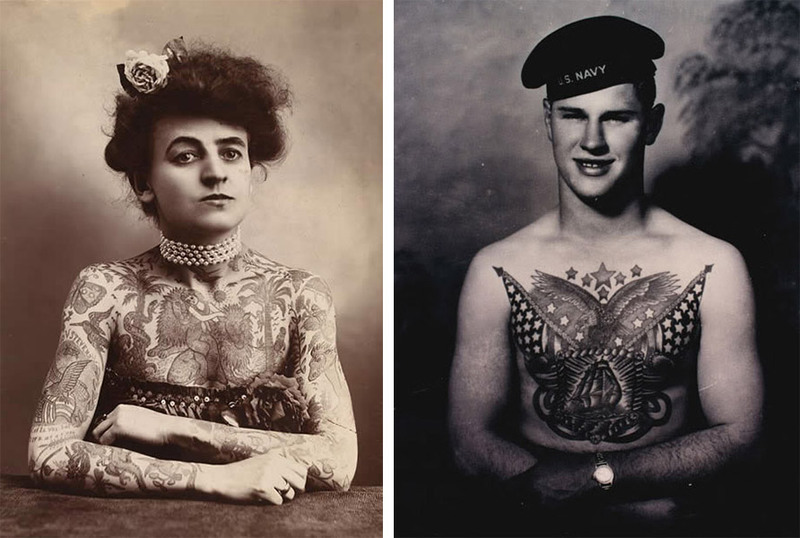 In the 20th century, popular media outlets repeatedly hyped this dual view of tattooing as both a chic fashion for the wealthy and an expression of vile barbarity. 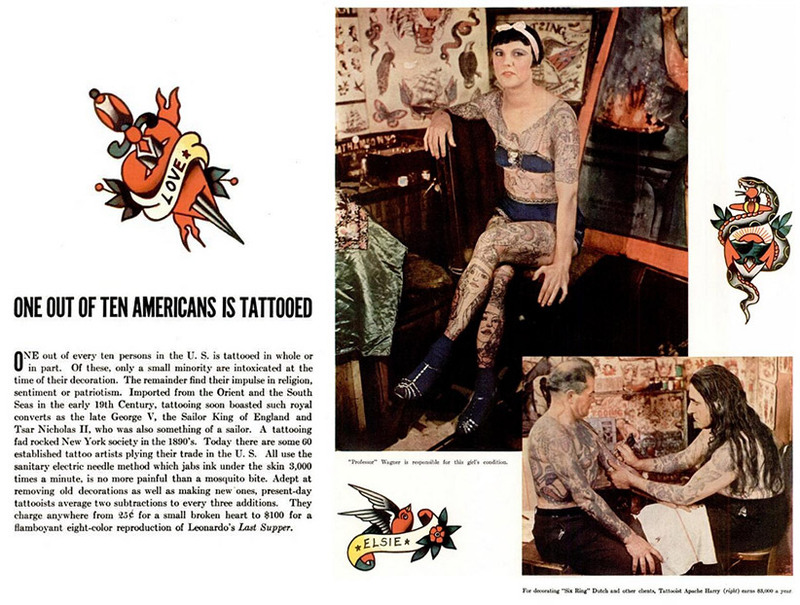 A Vanity Fair article from 1926 claimed that tattoos had “percolated through the entire social stratum; tattooing has received its credentials, and may now be found beneath many a tailored shirt.” Ten years later, Life Magazine published an article that claimed 1 in 10 Americans had a tattoo. After extensive research, Lodder has come to realize that “even when the press praised tattooing as newly respectable, newly fashionable, and a spectacular and ancient art form, as has happened every decade since the 1880s, other corners of the commentariat would decry tattooing as primitive, barbarous, and uncouth. Rather than waxing and waning in social acceptability over the 20th century, it’s more accurate to see these two strands as running in parallel.” Though sensationalist articles were meant to sow the seeds of controversy among readers, the majority of whom certainly did not have tattoos, they often reveal this repeated fallacy in the media coverage of tattoos. A spread from the 1936 “Life Magazine” expose on tattoos in America. 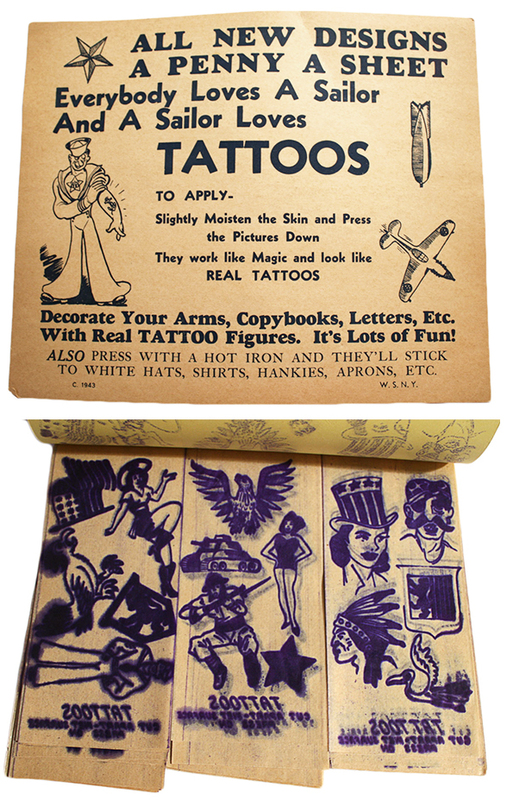 Temporary tattoo products have long banked on the trendiness of sailor tattoos, as seen in this 1940s booklet. Image courtesy Ballyhoo Vintage. But why are nautical tattoos so trendy today? “I think that pop culture goes in cycles, and tattooing has to be considered part of pop culture,” says Eldridge. Lodder also sees it as part of a generational cycle, in which the designs of our immediate past go out of style and those from earlier periods seem fresh again. 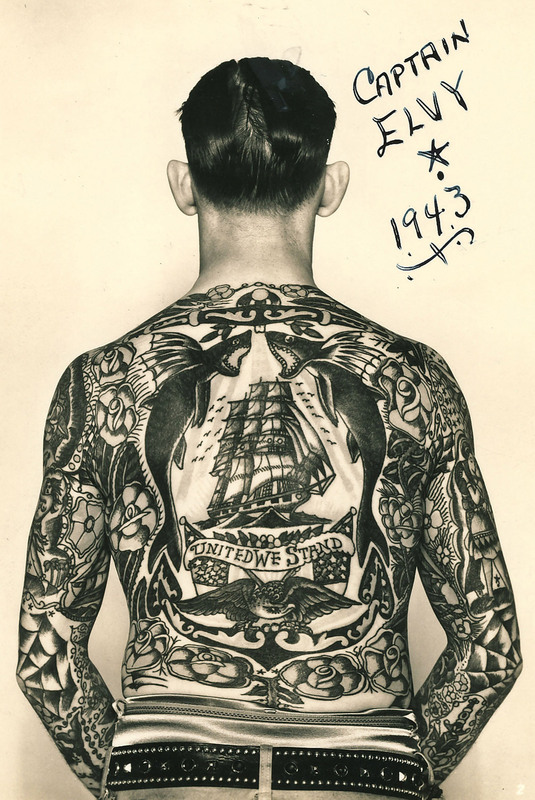 The youth of the 1920s preferred the nautical imagery from the 1860s, rather than the Asian-influenced designs of the 1890s, while World War II linked tattooing so closely with the military that the postwar generation had little interest in tattoos. Which brings us to the present, and the hordes of young urbanites whose flesh is marked with symbols of mariners from centuries past. Eldridge finds that brands like Christian Audiger’s line of Ed Hardy clothing or Sailor Jerry Rum have had “a tremendous effect on the current popularity of traditional tattooing.” In 1995, Hardy also published “Flash from the Past,” which Lodder believes prefigured the revival of classic American tattooing. 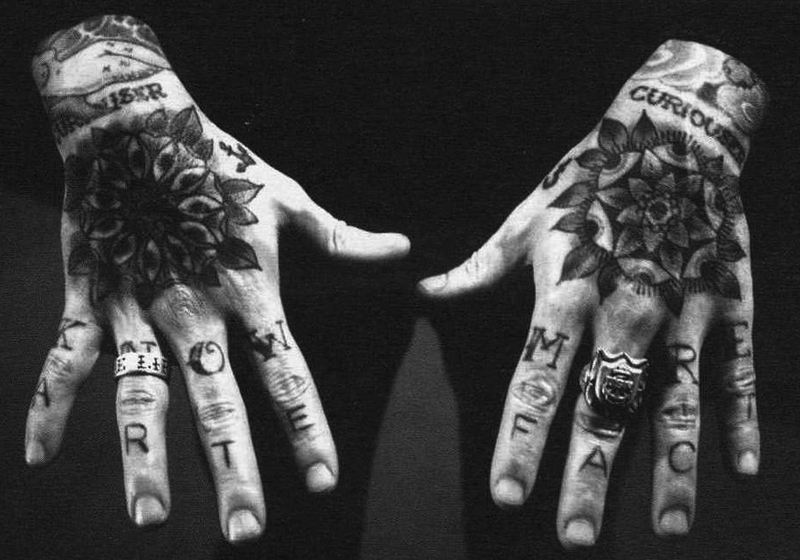 Matt Lodder’s “Know More” hand tattoos blend naval superstition with academic sensibility. To learn more about historic tattoos, follow Dr. Matt Lodder on Twitter, visit C.W. Eldridge at the Tattoo Archive in Winston Salem, North Carolina, and check out the Ballyhoo Vintage blog. In a few years there will be a fortune to be made in tattoo removable. A tattoo in your 20’s seems cool, 30’s blah 40’s what was I thinking 50’s get this sh*t off of me. Lucky I never got THAT drunk to deface the beauty of the human body. Tattoo the Word- first recorded in 1721 by Sir James Turner, a military historian, used the word tattoo to denote the beating of military drums that signaled the closing the canteen in garrison or camp.From the Middle English “Tap-Toe” keeping time…the sailors on Cooks ship would be very familiar with it. The O’Reilly machine was a rotary and the electromagnetic coil machine was an Englishmans idea – Tom Riley of London, England patented his electromagnetic coil machine on Dec. 28th 1891 twenty days after Sam O’Reilly filed his U.S. patent. Tom Riley’s machine had a single coil and was a modified door bell assembly contained in a brass box. The modern configuration of two coils in series was patented by Alfred Charles South of Cockspur St. London (Patented London Jun. 30th 1899) 30 years before Percy Waters in 1929. The Americans don’t like to admit that one…HA! And the vast majority of Norman Collins work was Armund Dietzels flash, almost line for line…in some cases decades before Sailor Jer’ was tattooing. A bit more actual research and this may have been a good article. C-. Just the reminder I need to get another tatoo! Great historical info. If you are interested in looking at photographs of traditional moko (Maori tatoos) here’s a link to images from the national museum of New Zealand – Te Papa. The only people who regret getting a tattoo are people who don’t consider what they’re doing in the first place. Great read that puts tattooing in a proper historical context. Well done. I chose tat’s with the thought of nature in mind. Water, the sky, a couple ancient symbols, nothing over the top… therefore I have no regret’s. I have never placed someone’s name on my skin, or something I believed in for a year, or two. I like looking at them all, but a couple was fine for me. This is a great article – thank you for posting it! Indeed a well-researched article. Always good to see continued efforts to connect today’s tattooing to its rich past. Great to see C.W. Eldredge recognized for the wealth of knowledge he has assembled for the Tattoo Archive in Salem, N.C..
For more information consult the exhibit catalog, Skin and Bones – Tattoos in the Life of the American Sailor an exhibit originated by Independence Seaport Museum, Philadelphia in 2009, and traveled to Mystic Seaport Museum in 2011. Thank You for this Brilliant and Educational Article, I have learned so much in just five minutes. In particular, I did not have a clue where and why the Tattoo originated. An Amazing Compilation, to say the least. I feel like going to get Inked myself after reading this Article. Cheers, Jan.
Great article. I got my first tattoo at the age of 36, 21 years ago, and have never regretted it. My last tattoo is of Popeye, who also has an anchor tattoo on his right forearm. Triangle Tattoo and Museum thanks CW. Eldridge for this informative and fascinating information. Stewed, Screwed and Tattooed! I would like to know where you got the picture and information about “Captain” Elvy. He was my great uncle, Elvy Campbell. “ ” I listened to all the blues 45s and 78s in my big sister’s record collection.